[prMac.com] Tokyo, Japan - Sola K.K, an emerging Japanese IT company, has released monoca 4.1, an important update to its new lifestyle app developed exclusively for iPhone, iPad and iPod touch devices. monoca is an easy-to-use life assistant, an application to manage items, collections, inventories and future purchases. The aim of the app is to make everyday tasks easily manageable by keeping a record of the items already owned by the user and the items to be purchased in the future. It features a simple and clear interface to make item management smooth and easy. Out of the box, a huge number of items and categories are already included within the app, but thanks to the many easy-to-use item recognizing functions, unique and personal items or categories can also be easily recorded. Not only the items, but several details of the purchases are also being recorded, including the time and place of the purchase, the contact information of the seller and the manufacturer or the last day of the warranty. Items ordered from Amazon will be added automatically, while collections and wish lists can be shared between groups and friends. Collections are being stored in the cloud, so there is no risk of data loss. The application has received overwhelmingly positive reviews from both users and critics in Japan. 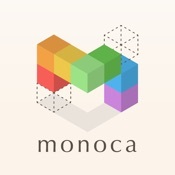 "With monoca it's just a few taps to manage and categorize all the items you own, maintain your collections, control your inventory or just to do simple tasks like everyday shopping. Create a list of items you want to own, keep yourself organized and avoid any unnecessary purchases. Monoca has a simple, clear interface what makes managing your items a joy. Customize the application as you like, as it fits you and your purposes the best. monoca is an easy to use life assistant, an application to manage your every[thing]." This is the company's first application outside of Japan with English localization. Version 4.1 fixes a critical problem. monoca 4.1 is Free and available worldwide exclusively through the App Store in the Lifestyle category. For more information, please contact Keisuke Yoshimura. Based in the heart of Tokyo, Japan, Sola K.K (Sola Kabushiki Kaisha-stock company) was established in 2008 by CEO Keisuke Yoshimura, a fast growing IT company, software and application developer. Sola features IT infrastructure and system development and is ISO 9001 and ISO 27001 certified. All Material and Software (C) Copyright 2008-2017 Sola K.K. All Rights Reserved. Apple, the Apple logo, iPhone, iPod and iPad are registered trademarks of Apple Inc. in the U.S. and/or other countries. Other trademarks and registered trademarks may be the property of their respective owners.